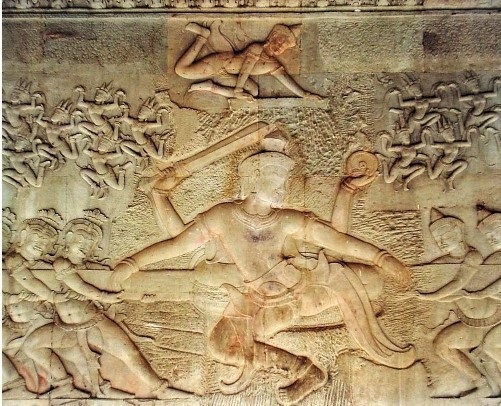 "Indic Influences on Dance as Devotion in Angkor"
Starting with insights on how Indic-Khmer architecture reflected the human body structure, the author, a "movement artist" herself, studies the symbolism and cultural significance of devotional dance in the Angkorian civilization. The short but strongly documented study focuses on the Hall of Dancers at Preah Khan, where more than 1,000 dancers used to gather and perform sacred dances. A movement artist based in Singapore, Chloe Calderon Chotrani (1992, Manila) is a dance theorician and practicioner. Holding a Postgraduate Diploma in Asian Arts from the School of Oriental and African Studies (London) and a BA in Arts Management, she has trained and performed with Romançon Dance Company (Manila), B Supreme (London), Ecole Des Sables (Senegal), Omi Intl Dance Collective (Hudson), Evidence/Ronald Brown Dance Community (New York), Movement Research (New York), and Gati Dance Forum (New Delhi).